Bats are NOT blind. But flying at night is difficult – bats’ eyes need light in order to see. Imagine being in the school at night with all the lights out and trying to walk or run around without everyone bumping into each other! For us humans this would be very difficult. You could get hurt! Bats are not blind but their eyes see best in dim light. Usually bats use sounds and echoes, instead of eyesight, to find their way around at night. Bats ECHOLOCATE. Ask a parent or teacher if you need help saying this word. Bats are not blind, they can see best in dim light. Have you ever heard an echo? This is where a sound bounces off something, maybe a wall or even a mountain, and you hear it again a short while later. Sounds that are low pitched are the sound of thunder or the noise from a big drum. High pitched sounds that humans can hear are squeaks of a mouse or from a rusty gate. Most of the sounds that bats make are way too high pitched for us to hear – and these kinds of sounds are called ULTRASOUND. The sounds that bats make are so high pitched that humans cannot hear them. High pitched sounds like this are called ultrasound. So, bats make high pitched squeaks while they fly. The sounds then move through the air and some bounce off trees, insects, walls or whatever is around the bat. The echoes travel back to the bat and it can then tell how far away the objects are. This all happens very quickly, bats make lots and lots of high pitched noises one after the other, one with each wingbeat, and echoes come back after just a split second. 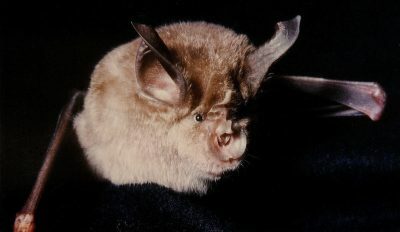 Most bats have super hearing which is made even better by the shape and size of their ears. Some bats have special, very odd-shaped noses that they use to focus their squeaks to make their echolocation even better. Image by Hans Schneider reproduced under GNU free documentation licence. 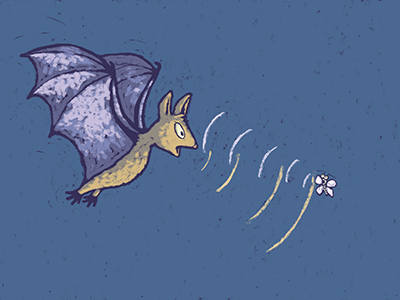 A bat’s echolocation works so well that it can fly in the dark knowing where everything is and it can also tell the size and shape of objects around it. Bats using echolocation can also hear where something as small as an insect is, what direction it’s moving in and whether it is beating its wings. This means that they can find, chase and catch their prey using sound alone. 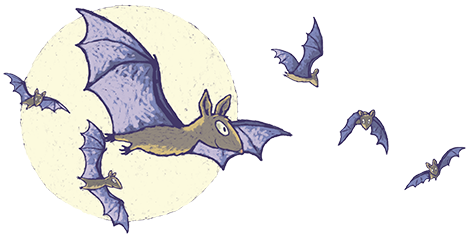 Now you know that bats are not blind – but can you answer the rest of the questions in this worksheet?